I should have guessed Frank would give us Roll this week as our theme following last week’s Rock! The first thing I thought of was bacon rolls or if you prefer pastry, sausage rolls, which is typical of me as I seem to be hungry all the time! But then I thought of dogs and yeah, you’ve guessed it, rolling in something they shouldn’t. Kizzy, my GSD was terrible. 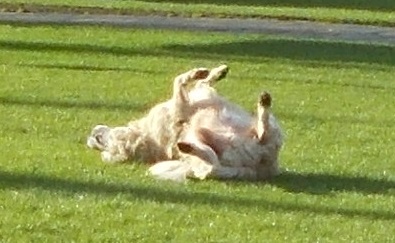 The greener and smellier fox poo she could find, the more delirious her pleasure. Not so for us as we held our noses and gave her a cold shower at the stand pipe on the camp site, but that still didn’t get rid of the whiff! E-ew off the scale! Maggie on the other hand isn’t one to roll in the sand, the grass or even the hay, which is more than I can say for Buddy. This was taken on the grass in front of Wells Cathedral. Luckily Bud was just satisfying an itch. This entry was posted in blogging, Challenge and tagged fpj-photo-challenge. Bookmark the permalink.